PARIS (Bloomberg) -- Renault reported a 0.1 percent decline in first-quarter revenue as the euro’s gains on currency markets offset higher car deliveries. Sales fell to 8.26 billion euros ($11.4 billion) from 8.27 billion euros a year earlier, the company said in a statement on Thursday. Deliveries climbed 5.1 percent to 636,239 vehicles as demand for Dacia cars such as the Sandero hatchback rose. "The European market was better than anticipated in the quarter, and this is good news," Chief Financial Officer Dominique Thormann said on a conference call. He said a severe drop in demand in some key markets as well as adverse foreign-exchange movements burdened business outside Europe. Renault is pushing into emerging markets to reduce dependence on Europe, where demand is recovering from a two-decade low faster than expected. The company raised its forecast for industrywide sales in its home region this year to growth of 2 percent to 3 percent from 1 percent previously, even as it predicted Russian and Brazilian markets will decline. 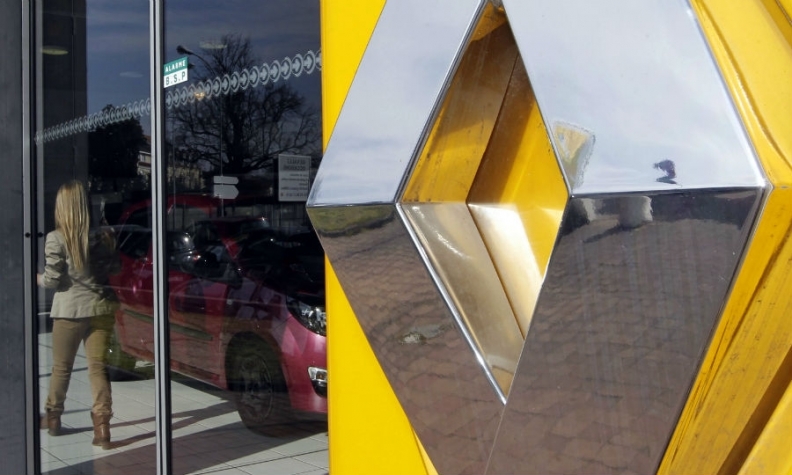 Renault’s expansion abroad left it exposed to the appreciation of the euro against currencies including the Brazilian real, Russian ruble and Argentine peso. Renault said that foreign-exchange fluctuations burdened automotive revenue by 409 million euros in the first quarter. "Foreign exchange has been a major headwind but fully in line with my assumptions," said Sascha Gommel, an analyst with Commerzbank in Frankfurt. "Pricing was a bit better, which might indicate an improvement in Europe." Even with the setback in the first quarter, Renault stuck to a target of increasing operating profit and generating positive automotive free cash flow in 2014. The company is also aiming for an increase in full-year auto deliveries and group revenue, excluding currency effects. Demand for Dacia’s two best-selling cars in Europe, the revamped Duster sport-utility vehicle and the Sandero, fueled a 42 percent jump in the brand’s first-quarter sales in the region. The no-frills nameplate helped Renault’s European sales climb 19 percent in the period, more than double the industrywide gain of 8.1 percent as the market revives from a six-year slump. "There is a big recovery coming in Europe," CEO Carlos Ghosn said in an interview on April 15 at the opening of a plant in Brazil, Renault’s second-largest market after France. Renault’s first-quarter deliveries in Brazil surged 22 percent after it recovered from the closure of a local plant last year. In Russia, its third-biggest market, sales fell 3.7 percent. Renault and Nissan have made a big bet on the future of the country’s car market by taking control of AvtoVAZ, the maker of Lada models and Russia’s largest auto producer. Renault is also expanding in India, where it plans to double its market share, and in China, where it received approval in December to build its first plant in the country. The Renault group reported a 5.1% increase in registrations in the first quarter of 2014, thanks to an improvement in European markets and to the success of its new models. Revenues remained flat despite negative impact of currency devaluations. 5.1% increase in registrations to 636,239 units versus the first-quarter 2013. Market share up 0.8 points in Europe. Renault group revenues of €8,257 million in first-quarter 2014, stable compared with the same period in 2013 (+ 5.1% on a like-for-like basis excluding currency effects). Automotive revenues stable at €7,727 million. In a global automotive market that grew 4.7%, Renault group registrations rose 5.1% to 636,239 units. In Europe, Group sales grew 17.7%, in a market that expanded 8.2%. Clio, Captur and Sandero drove market share gains. Outside Europe, the downward trend in its main international markets led Group registrations down 7.9%; they now account for 43% of total sales, compared with 49% in first-quarter 2013. Duster remains the Group’s best-selling vehicle globally, with 97,280 units sold. In Europe: in a market that grew 8.2%, driven primarily by Southern Europe, the Group increased registrations 17.7%, bringing its market share in passenger cars (PC) and light commercial vehicles (LCV) to 9.7%, an increase of 0.8 points. The strongest increases came from France (+ 8.2%), Italy (+ 37.4%), Spain (+ 21.4%) and the UK (+ 100.1%). The success of the new Renault products and the Dacia brand, which posted the strongest registration increase in the market, explain the strong performance in the UK. The Renault brand ranked No. 3 in the PC + LCV market with a share of 7.2%, up 0.1 points. It remains leader on the LCV market, with market share of 13.7%. Dacia was the fastest growing brand in the market. Sales increased 46.1% giving a market share of 2.5% (+ 0.6 points), driven primarily by strong momentum in the UK. The Group’s three best-sellers in Europe were Clio with close to 76,000 vehicles, Captur with 41,500 units and Sandero with 39,000 units. With the success of these vehicles, the Group maintained its No. 1 position on the B segment in Europe. In the Americas region, Group sales rose 8.9% in a market that contracted by 3.5%. In Brazil, registrations increased 21.8% in a market that fell 1.8%. In the wake of the disruptions caused by the closure of the Curitiba plant in early 2013. Group market share rose back to 6.7%, up 1.3 points. In Argentina, registrations fell 7.7% in a market that dropped 13.0%. Group market share came to 15.1% (+ 0.9 points). In the Eurasia region, sales were down 1.0% in a market that contracted 2.0%. In Russia, Group market share remained steady at 7.7% with registrations down 3.7%. The Renault brand continued to rank No. 2 in Russia behind Lada. In the Euromed-Africa region, registrations fell 14.9% in a market that was down 10.8%. After a period of strong growth, the Algerian market entered a downward phase, with a drop of 28.3% in the quarter. Following strong sales at the end of 2013, the Group, which remains market leader in Algeria with a 23% share (- 2.2 points), saw registrations fall 34.5%. Turkey reported an 18.1% fall in sales in a market that was down 24.5%. The Group achieved market share of 18.7%, a rise of 1.4 points. In the Asia-Pacific region, Group registrations fell 30.0% due to the situation in Iran (- 12.6% excluding Iran) and the downturn on the Indian market. In South Korea, Renault Samsung Motors saw volumes increase 16.9% with market share of 4.0%, up 0.3 points. In the first-quarter 2014, Group revenues came to €8,257 million, stable compared to the same period last year (+ 5.1% on a like-for-like basis excluding currency effects). Automotive revenues totaled €7,727 million (- 0.1%). The drop in the main emerging country currencies versus the Euro (Argentinean peso, Russian ruble, etc.) had a negative impact of 5.3 points, partially offset by a positive price effect of 1.3 points. The increase in sales to partners (vehicles and components) made a positive contribution of 3.1 points. Sales Financing (RCI Banque) reported revenues of €530 million, stable (+ 0.2%) versus 2013. As a result of Renault group’s strong momentum in Europe, the number of new financing contracts rose 9.8% to 280,455 in first-quarter 2014. Average loans outstanding increased despite a negative currency impact, particularly in the Americas region, by 2.3% to €24.7 billion. In the first quarter, trends in key markets were contrasted. While main emerging markets were slowing down with poor visibility, the European market recovery appeared stronger than foreseen. In this uncertain environment, the Group expects slightly declining Russian and Brazilian markets. However, the European market should grow by 2% to 3% in 2014.
achieve positive Automotive operational free cash flow.